Leeds: Printed by D.B. Whirst For the Author, 1818. First edition. From the library of Colonel Adamson, K.T.S., who participated in the events described in this work; with his signature on the titlepage. Tall 8vo., contemporary calf spine, marble boards, ii, 242pp. With a map of South America and a Chart of Rio de la Plata. 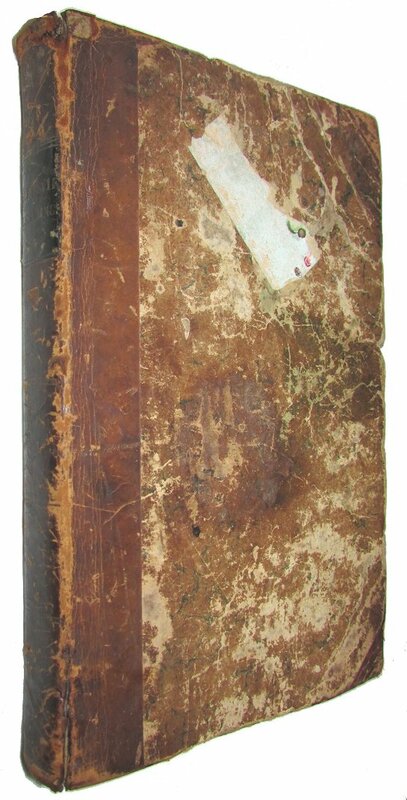 Approximately 50pp has brown stains (mostly marginal/foxing) and there is occasional browning and foxing, the map and chart both have some foxing, the outer front hinge is slightly cracked and tender, the binding has wear and rubbing but this is still an acceptable copy. Alexander Gillespie served as a Major in the Royal Marines, and Colonel (then Lieutenant) Peter Adamson took part in the invasions of the River Plate during the Napoleonic Wars. The British made several unsuccessful attempts to seize control of the Spanish colonies around the Plate Basin in South America in 1806 and 1807. During the first invasion in 1806, the British occupied Buenos Aires but were expelled in 1807, and the second involved occupation of Montevideo while a second force attempted to retake Buenos Aires; in both instances the British forces were repelled. The defeat of the British in 1807 under General Whitelocke was deemed such a disaster that it resulted in Whitelocke's court-martial. Both Gillespie and Adamson were captured, the later escaped while Gillespie was eventually released but did not return to the United Kingdom for 10 years. Gillespie wrote the above account of his time in Buenos Aires. Peter Adamson (1779-1865), a Scot, was appointed an Ensign in 1800, a Lieutenant in 1801, and a Captain in 1808, and while on loan to the Portuguese Army rose to the rank of Brevet-Major General. He served at the Cape and in South America and was one of the few who effected their escape from the interior of South America after the failed British invasion. In June of 1807 he wrote "Having effected my escape from the interior of South America, I take the liberty of informing you, that... I left the following gentleman along with my friend, your brother viz. Captains Mackenzie and Gillespie... 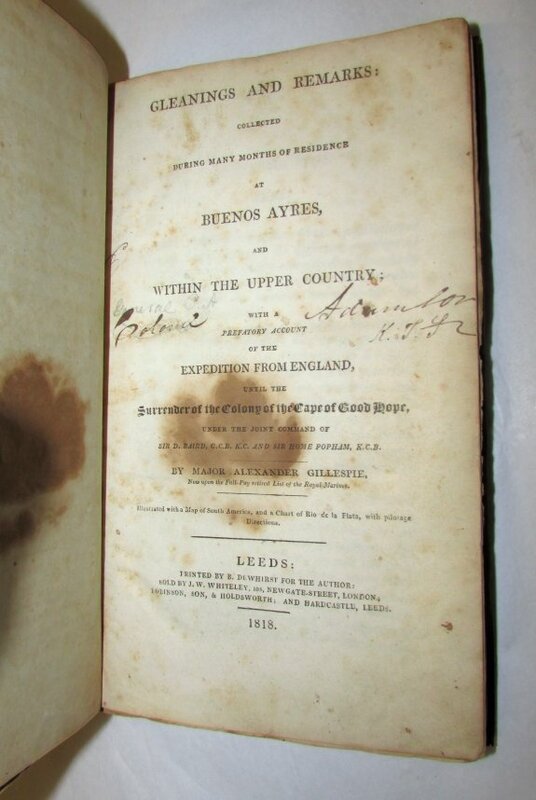 I think I may venture to say, that we shall have the power of liberating our brother officers in very few weeks, as Buenos Ayres must fall immediately..." Adamson's role in the British invasion, occupation and subsequent expulsion from Buenos Aires is covered in Gillespie's account as he is mentioned on numerous pages. In 1817 Adamson had made a journey to Canada and purchased property and he returned in 1820, settling in Canada (Erindale now part of Mississauga) for the remainder of his life. He served as a member of the Legislative Council of Upper Canada until the Union in 1841.